24 June 2016 – Dig Delve – An online magazine about gardens, landscape, growing & making. 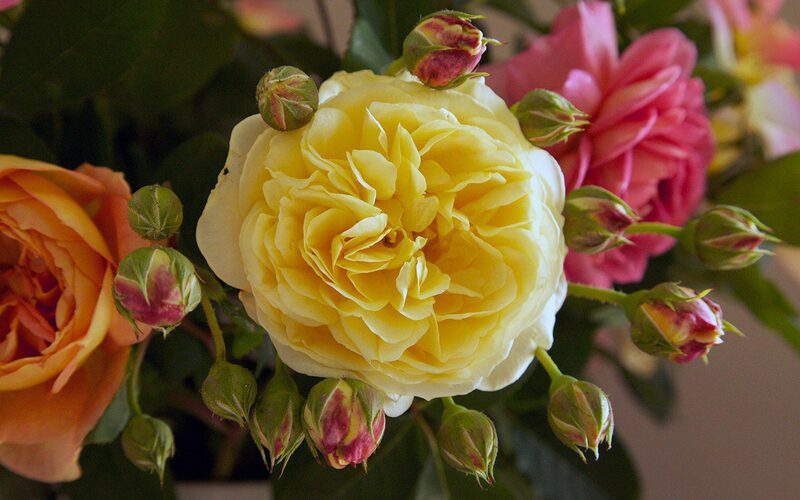 The third week in June, around the solstice, is when the roses are at their best – first flowers opened and buds yet to come. The week usually coincides with weather and this bunch was picked just before a black sky gave way to thunder, lightning and downpour. The roses are part of my trial of getting to know good garden plants. There was never room to indulge their showiness in the Peckham garden and, when we arrived here, they were one of the first things that were planted. I felt I could get away with them if they were treated as part of a productive garden. They push against the flow of what we want to do here and couldn’t be more out of place with the landscape backdrop. But a bunch brought in for the house is an opulent indulgence. They are now in their sixth summer and I am beginning to see which are the good ones and which are the weaklings. 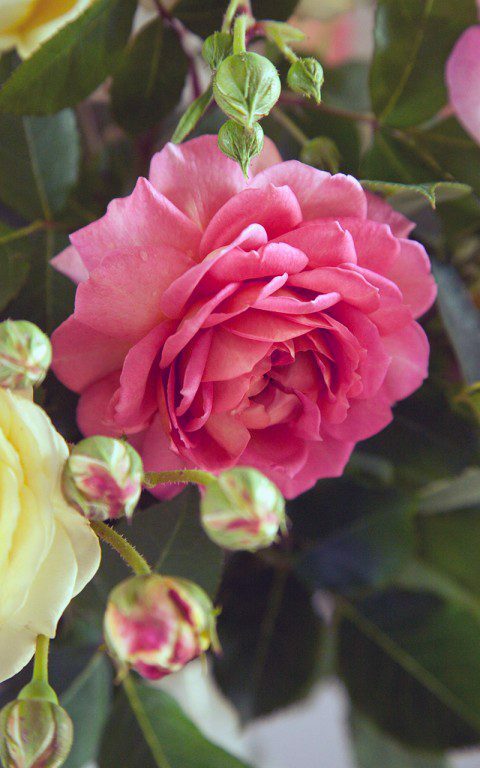 There are twenty four varieties in total, all David Austin selections and each was chosen for their perfume, colour, flower shape and general mood. Here are a bunch of a half dozen. I like to have singles in the mix as they bring a little of the wild as a contrast to the doubles. 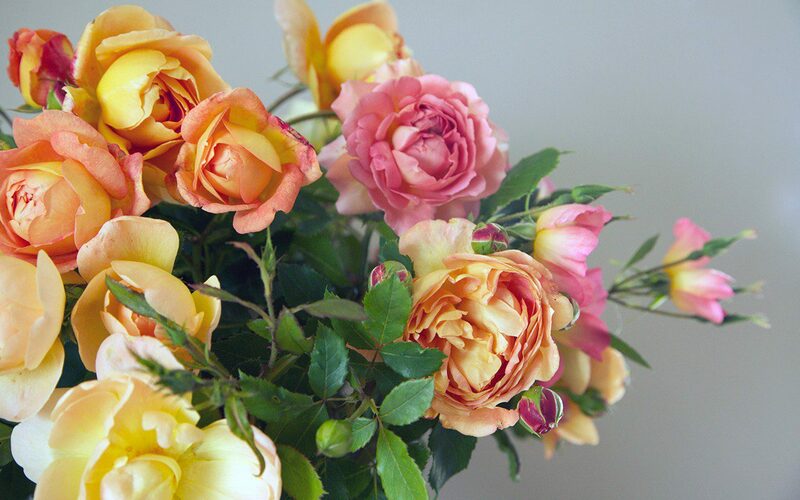 The Alexandra Rose is one of my favourites, making a relaxed bush and open sprays of flower that fade as they age. 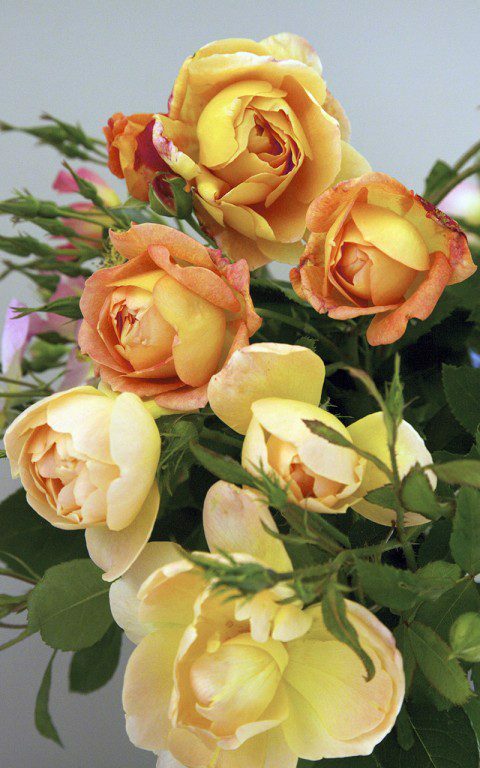 Jubilee Celebration is perhaps the weakest plant, but not unhealthy, and it has a strong true rose scent. 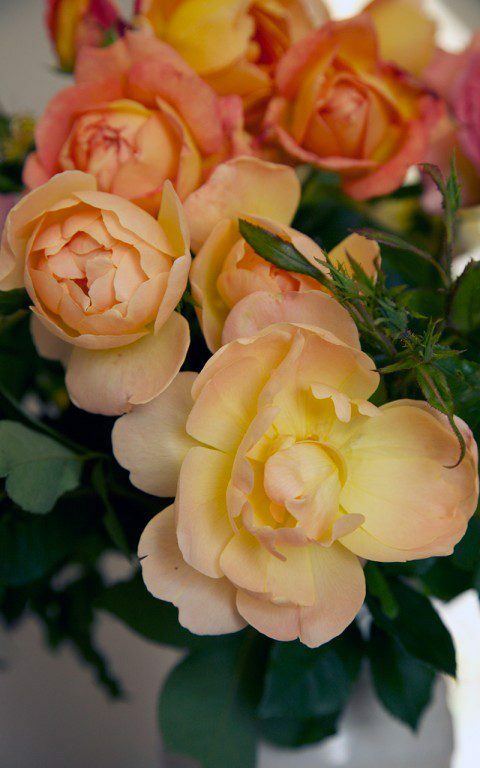 The colour is a very distinctive old rose which ages to apricot. It is also a wonderful shape with backward curled petals. Pat Austin is a rangy grower, but healthy and consistent. The flowers are a golden peach, slightly pendulous on the bush and smell of Earl Grey tea. 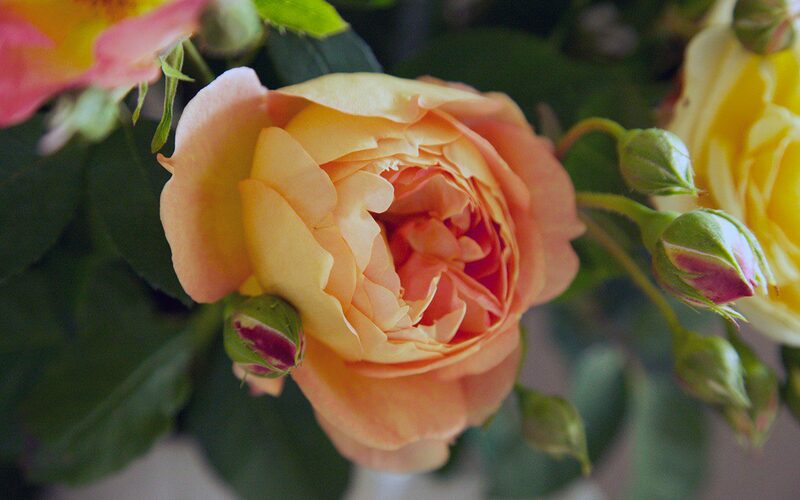 Lady of Shallot’s bowl-shaped blooms are shot pink over apricot. The colour is duller than Pat Austin but no less lovely. Teasing Georgia is the most yellow of this bunch. 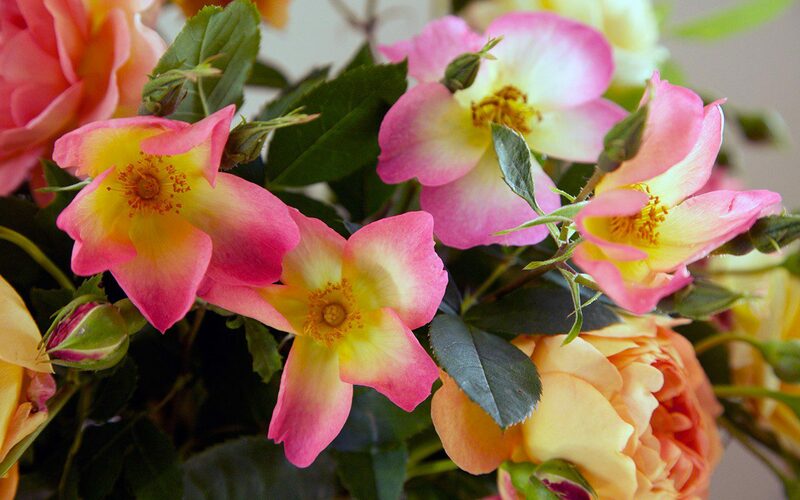 It is a really good rose with plenty of vigour, which can be put to a wall and trained as a climber. 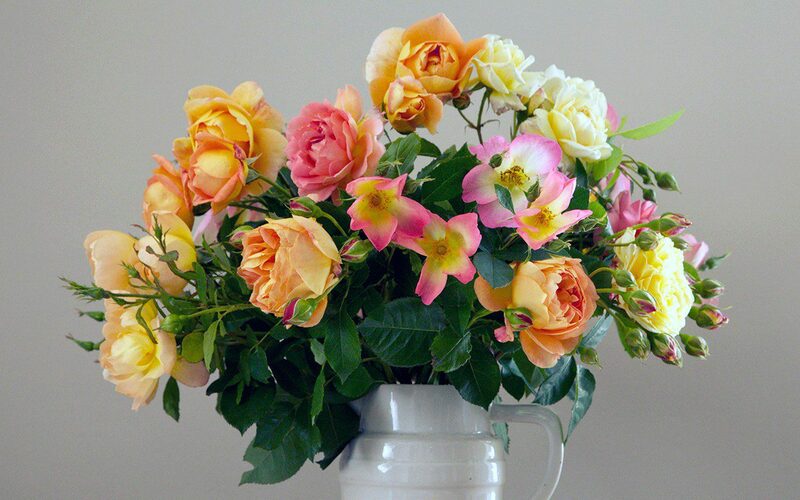 The flowers are the most quartered of this selection and open flat. The Lark Ascending is not such a good picker as it drops quickly, but I love it’s loose pale peach flowers which seem to tumble from the bush. It has fewer petals and it is a pretty grower, never stiff and therefore a good candidate for a mixed planting in a border. Not that this will be the case here. The cutting garden is the cutting garden where I can break my own rules and simply enjoy the flowers.